Because of the wet fall, many producers have faced extremely difficult field curing conditions for their hay. Additionally, hay that was bone dry in the field has, in many cases, developed mold problems in the barn. This later issue has been problematic for us in 2015, resulting in a large number of square and round bales covered with black sooty mold. It is arguably more problematic because this is often a barn design issue (e.g., open sides, poor air drainage, lack of ventilation, inability to close off ventilation, etc.). Under the high levels of humidity that we’ve had (because of periods of nearly continuous rain and cool weather) the last 2 months, dry hay will draw moisture from the moist air. For example, hay that is 12-15% moisture (the appropriate moisture for hay storage) may have a 6-12” layer along any exposed surface that may equilibrate at about 30%+ moisture if the surrounding environment is cool (< 70 F) and moist (relative humidity stays > 60%). Any moisture level greater than 20% on the surface could result in significant mold growth/discoloration, and levels greater than 30% moisture can result in the entire stack’s exposed surface being covered in black sooty mold.As a result, our County Extension Agents and I have had an extraordinary number of emails and calls about feeding moldy hay, especially to horses. First, let me clearly state: moldy or dusty hay should NOT be fed to horses. Moldy and dusty hay can lead to respiratory issues in the horse, and can also pose health risks to the men and women who feed the hay to the livestock (e.g., farmer’s lung, etc.). Here’s a link to an excellent Extension article on the subject. Soaking the hay in a water trough before feeding will reduce the “dust” (which is usually mostly mold), but it will also leach out soluble sugars and lower forage quality. This may not reduce the risk of mycotoxins (and yes, hay can have mycotoxins in it just like moldy grain, peanuts, or oilseeds can have in them). For a discussion of mycotoxins, see this article I wrote on the subject. Several companies now sell hay “steamers,” which is a chamber or box wherein hay bales are placed and steam is pumped into the chamber. In addition to the expense, the downside of these steamers is that they will lower the forage nutritive value of the hay and they are unlikely to change the mycotoxin levels appreciably.Ruminant animals aren’t as sensitive to mold problems as horses, but they still can be negatively impacted if care is not taken to prevent health challenges. Feeding slightly to moderately moldy hay (mold spore counts up to 1 million cfu/gram) is relatively safe if feeding cattle or small ruminants, as long as the animals are fed outside or in a very well-ventilated feeding area. Keep in mind that palatability is likely to be a challenge. Hay that emits a substantial cloud of “dust” or continues to emit dust after the disturbance ceases should be assumed to be > 1 million cfu/gram. A test can confirm mold levels. 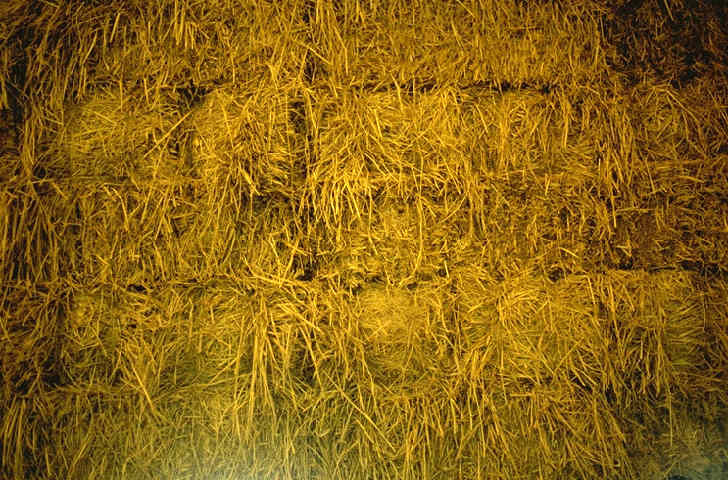 Hay that is obviously moldy (moldy or “mousey” smell or sending off visible “dust” or mold spores when disturbed) should be tested for mycotoxins before being fed. UGA’s Feed and Environmental Water Laboratory (our forage lab) is not equipped to conduct the mold spore count test or the mycotoxin screen. (To my knowledge, Waters Agricultural Labs in Camilla, GA is also not equipped for these tests, but you can contact them to confirm.) You can, however, work through the UGA lab to arrange for these tests to occur. Alternatively, you can submit samples directly to labs that do conduct these tests (e.g, Cumberland Valley Analytical Services, Dairy One).Bales that are covered with black sooty mold on the exterior can be removed and discarded, and usually the interior bales are not affected. Bale stack design can help minimize the surface area exposed and, thereby, minimize the damage. Barn design issues can also be corrected to prevent this problem in the future. Barns that can be open to allow moisture to escape during the initial 2-4 weeks of storage and then shut during prolonged periods of high humidity and cool temperatures will offer flexibility in this regard. For more information on forage management issues, visit our website at www.georgiaforages.com. If you have additional forage management questions, visit or contact your local University of Georgia Cooperative Extension office by dialing 1-800-ASK-UGA1. Posted in Forages. Bookmark the permalink.